The Domain Name System (DNS) is one of the cornerstones of the Internet's infrastructure. It "translates" domain names into IP addresses. Whenever you open a site like ghacks.net, DNS is used to look up the IP address of the server to make the connection. Queries are cached by many operation systems to speed things up, and some browsers predict activities to look them up before the user even clicks on links. Most Internet users do not come into contact with DNS or the configuration thereof. They use the DNS of their Internet Service Provider (ISP) and that is it. This may not be the best move for them in terms of speed, safety or reliability though. That's why third party DNS services such as OpenDNS or GoogleDNS have risen in popularity over the last couple of years. If you want unfiltered results, basic is the way to go, while both Safe and Family may be used to block some contents from showing up on your computer. This is similar to how OpenDNS operates, even though the latter offers more customization and filtering options for users who have signed up for the service. Yandex, being a Russian company, has a strong presence in Russia. How fast are the company's servers if you are using them from a different location in the world? The company notes that it operates servers in more than 80 different locations worldwide to ensure fast look ups and service. 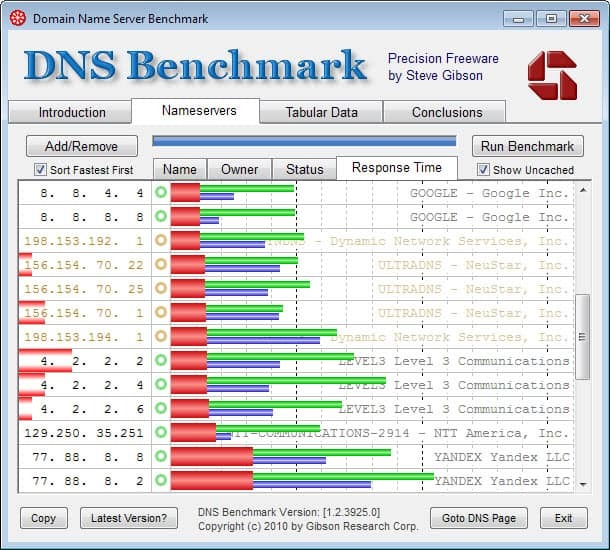 A quick check with DNS Benchmark revealed that it is not as fast as Google, UltraDNS or OpenDNS, especially when it comes to cached queries, but that the difference is less than the tenth of a second. Note: your results may vary depending on your location in the world and the servers you connect to. Set up may differ depending on which operating system and device you are using. Yandex offers instructions for all systems on its main website (scroll down). I would like to demonstrate how to add the DNS server on Windows 7, the operating system I'm using. The configuration is similar for other Windows systems, even though the way may differ. Click on the start button and select Control Panel on the right. Select View network status and tasks under Network and Internet. Click on the link next to Connections in the "view your active networks" section. Locate Internet Protocol Version 4 (TCP/IPv4), select it, and click on Properties. Select "Use the following DNS server addresses. Add the Yandex DNS servers that you want to use. You can alternatively set them up in the router. If you set them up on your computer, only the connections made by your computer are looked up using Yandex's DNS service. If you configure the DNS in the router, all connections made from all devices use it. Yandex.DNS offers an alternative to -- the mostly -- US operated third party DNS services. I'm not saying that it is more private or secure than those, only that it is an alternative. The DNS service was not the fastest, and if speed is your main concern, you may want to select one that performs better. If you want better filtering options, Open DNS or a comparable service is the way to go as they offer better customization options. Seems fitting that Yandex, a company synonymous with a great amount of spam that litters the likes of forums, blog comment sections and countless other places expands in this fashion. Good guys and bad guys, cowboys and Indians, wow: truth is so obvious. You hate Google – good for you? Why you felt that was relevant to anything in my response is a mystery. Being a Russian company, I wonder how their anti-piracy measures would affect this… If I remember correctly, Russia has their own version of SOPA that’s currently in place.